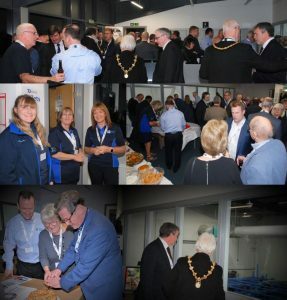 As part of our 70th Anniversary we hosted an open evening for all our friends, customers and suppliers to attend. We would like to say a big thank you to everyone that has supported us over the last 70 years and hope we continue to grow as a business. Giltbrook pride ourselves on being a quality family run business that really believes in what we do, the fact that ex-employees, suppliers and customers attended means we must have been doing something right for the past 70 years. At the event we were delighted to be joined by the Mayor of Erewash Cllr Mary Hopkinson, since moving to the area from our original Giltbrook location it has been a big success so having her their to help celebrate the area was great. At the event we also had a number of tables set up so our suppliers could showcase their products and people could really get an idea of how the whole workwear process comes together. Thank you to everyone that came and we are a very open company so will more than likely put on another event in the future. if you want to know more about our products and services then please get in touch, I’m sure we can help!